Every one enjoys going shopping. The planning involved before you set out with family or friends makes the shopping experience all the more unique. Here is an app named ‘Ultimate Shopping List’ that helps you shop smartly and have a stress-free trip to the supermarket! ‘Ultimate Shopping List’ is an Android app that facilitates the preparation of a complete shopping list. This shopping list generator can be used to build a list of various grocery and household items that are used on a daily basis and plan your trips to the supermarket accordingly. On tapping open the app, an icon named ‘Add New List’ appears on the home screen which can be used to create a new shopping list. You can name the list according to your convenience. Options to edit or delete a shopping list are also available. Tap on the ‘Add new items’ option to select items from the list or enter new ones. Ultimate Shopping List has more than 70 items ranging from air fresheners to zucchini, listed in alphabetically order. You can enter the quantity of each item in the ‘Quantity to Buy’ option. This app provides the flexibility of adding as many items as you want to the list. You are free to edit the shopping list, whenever required and save as many lists as you want. The most useful feature of ‘Ultimate Shopping List’ is that it displays the last purchase date and quantity of each item, whenever you make a new shopping list. This helps you to keep track of your requirements and plan subsequent shopping trips. The app proves to be a real time-saver as you have the option to edit previous shopping lists instead of creating a new one each time. 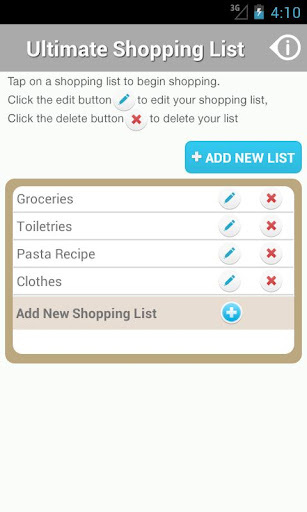 The interesting feature of this app is that you can make use of the reset option to strike off the items in the shopping list which have been purchased. I feel that an option to record the costs of various items in the shopping list could have been provided, to help in drawing up a budget according to requirements. Apart from this Ultimate Shopping list is an effective shopping tool that saves time, effort and money. The customized shopping lists help you plan meals for your family effortlessly. 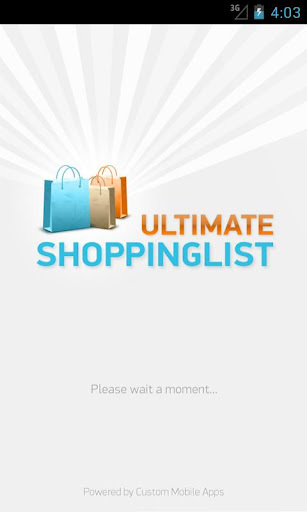 Ultimate Shopping List is a paid app that costs $1 and requires an Android version of 2.1 or later.